The women who played the role of the Amoshirare, received the water from the officials in Naha on December 28. 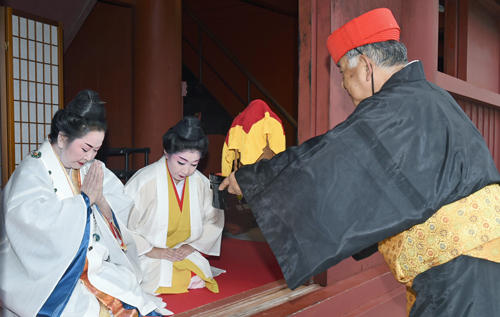 The Shuri Tonokura Community Association held a Nubi dedicatory ceremony at Shuri Castle on December 28. As part of the ceremony, people traditionally took water from the Heduukka River in Kunigami and presented it to the Ryukyu Kingdom’s authorities in Shuri. The ceremony was re-enacted in 1998 and the participants used to travel by bus to transport the water from the Heduukka River. This is the first time participants have run the 115 kilometer stretch from Heduukka to Shuri Castle to bring water by hand to Shuri castle. About 70 participants took part in the run. On this occasion, about 40 people, including local residents in officials’ costumes, noro or female oracles and female officials, paraded from the Shuri Community Center to the castle. At the back of the castle’s main temple, the officials presented the water to the Amoshirare or high-ranking female oracle. The local residents and tourists watched the stately performance of the ceremony.